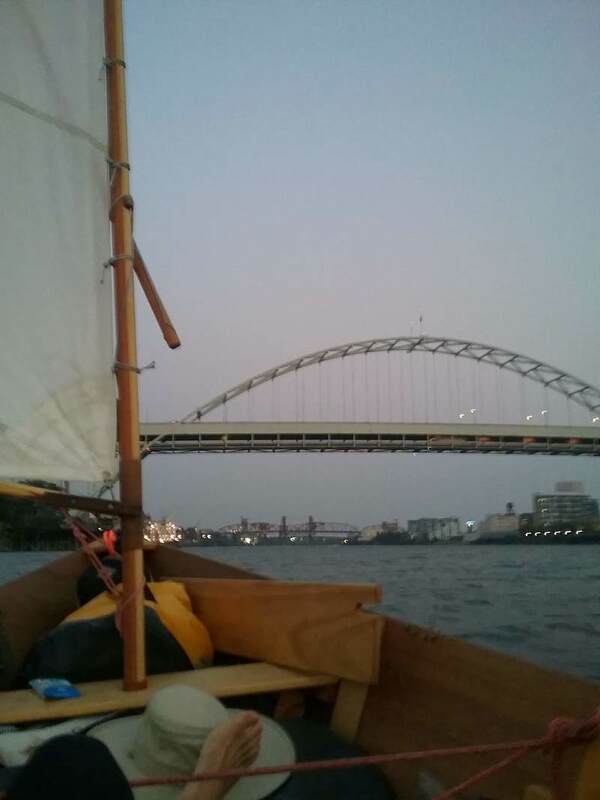 From Thursday, August 9 to Monday, August 13 this summer, I rowed and sailed my Salt Bay Skiff, Kimchi, from John Day Boat Ramp in Astoria to my home docks at the Willamette Sailing Club in Portland. 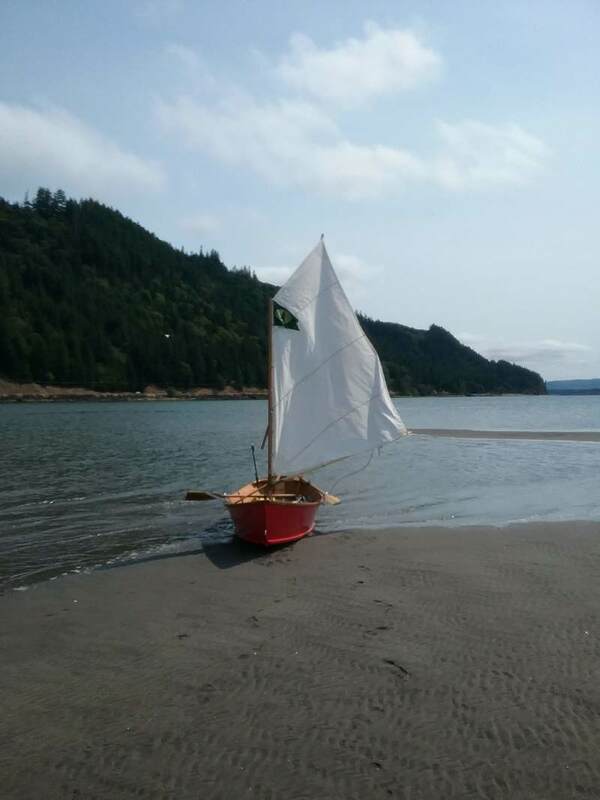 It was with John Ost’s expertise that I converted the Salt Bay shell I built at the 2017 Family Boat Build into the sailable Kimchi over the Summer and Fall of 2017. 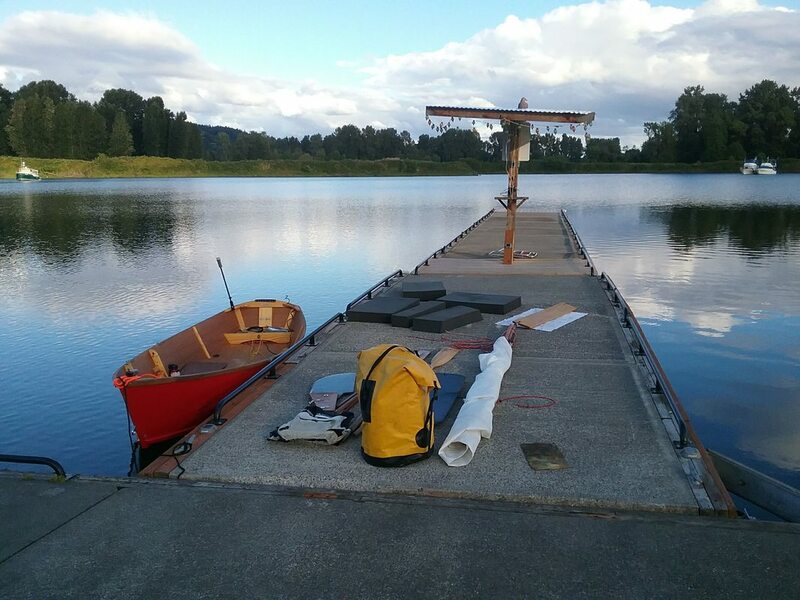 ​A fellow voyager, Charlie Gripp, made a similar journey up the Columbia as I was working on my boat. The first day began cloudy and calm, and I rowed for five miles through the brackish waters of the inner estuary, riding the flood tide. I wound up rowing about 30 percent of the time on the trip. Close to 30 miles, all told. 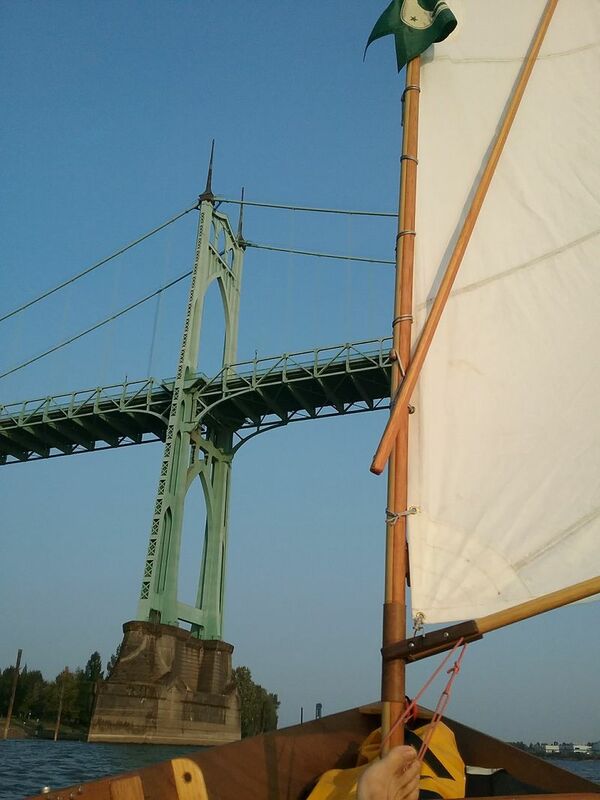 At noon the clouds burned off, the wind picked up, and soon I was scooting along upriver at 3 kts. In the photo right, the boat is pulled up on shore of Pillar Rock Island. The sand along the bank there behaved unlike any I have encountered before. When walking in the shallows, my feet would suddenly plunge six inches into the ground to an eruption of bubbles. I can only assume this was due to the way the river deposited sediment onto the shore, aerating it in the process. Whatever the cause, it made the sand fluffy above the waterline, and cavernously explosive below. ​Using my Fish-n-Map Co. map, I continued to navigate upriver, avoiding the shipping channel where I could, and taking the back routes around the many islands that dot the Lower Columbia. The map showed one such route as passable to a shallow draft boat. But I discovered, upon attempting to sail through it, that it was impassable to all but those boats with legs. At first I could pole the boat through marshland using the oars. But that only got me so far, and in the end I donned my watershoes and hauled the boat the rest of the way. The day continued, tranquilly uneventful, with a stop for lunch on Tenasilahe Island where I found monstrous blackberries larger than my thumb. I spent the night at Elochoman Slough Marina in Cathlamet, WA. All told, I traveled close to 20 miles in 11 hours. If I thought I made good time the first day, the second day set a blistering pace. I rowed for about an hour out of the marina, and by 9 AM the wind was strong enough for me to set the sail. I didn’t row again for nine hours, when I pulled up on the beach in front of El Tapatio Mexican Restaurant in Rainier, OR. The wind exceeded 15 kts at times, and in the main channel there was enough fetch for waves to build. I sailed laying flat in the boat, with my head under the tiller, propped up by a foam block to give me just enough visibility to avoid collisions. This proved to be the most stable place for my body, particularly when the boat surfed waves. I spent the night on the beach of Rainier after a sunbaked day on the water, 25 miles in 10 hours, and a steaming veggie burrito from El Tapatio. After two days of fantastic weather and great sailing, I began to worry that the trip might be over before it even began. Then I woke up to Saturday, August 11, gloomy skies, and an easterly wind. 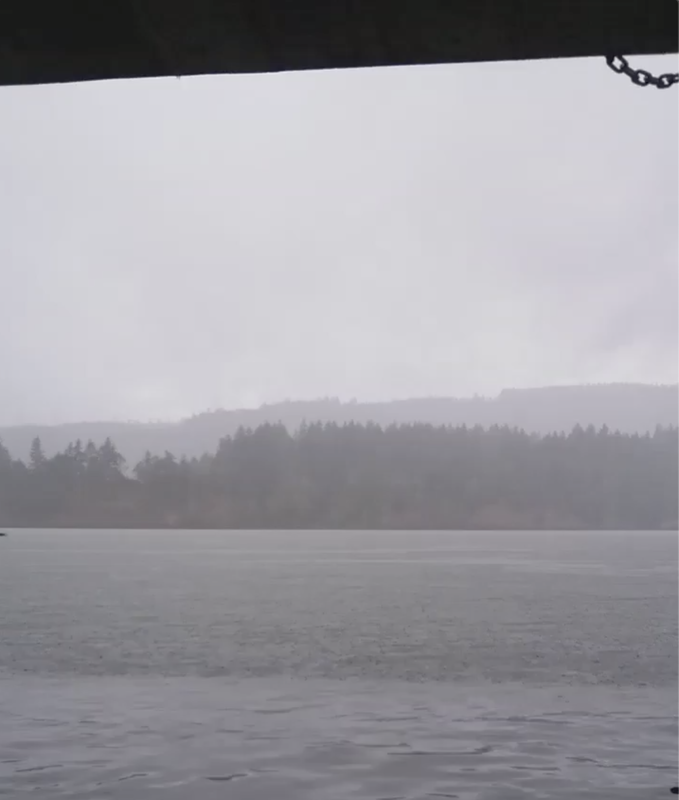 After I struggled upriver and upwind for about an hour, covering not more than one mile of ground, it began to rain. I figured it was a bad sign when the scores of fishermen lining the edges of the river packed up and left. Without that option, I pulled into the shallows behind Cottonwood Island, east of Rainier on the Washington side of the river, and bundled all my things together, stuffing what I could in the dry bag. I continued to row while the puddle in the bottom of my boat grew. Thankfully, the rain eventually faded, and I dried myself with the body heat generated by hard rowing. It was 1 PM, and I was still rowing, and hadn’t traveled more than 5 miles, when a second storm cloud rolled over the southern bank of the river and made clear its intentions to travel right over me. 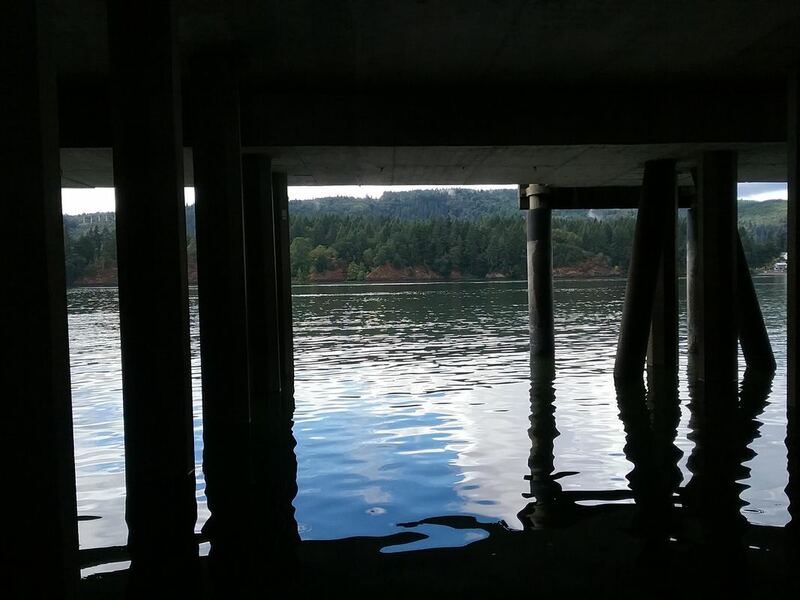 The only option was, as before, to continue rowing, and I probably would have had a worse day if I had not at that moment passed an industrial loading dock. I hid beneath it for an hour, wringing my clothes and bailing my boat, while the “light shower” mentioned in the forecast poured itself out. ​After all that bluster, it proved to be beautiful day. 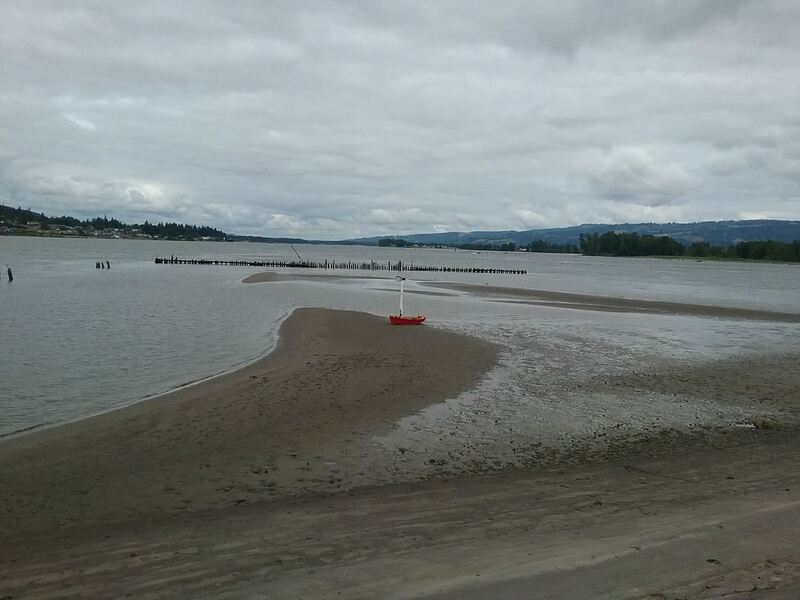 The wind came up around 2 pm, and I sailed into the cove maintained by Columbia River Yacht Club at the end of the Martin Island Slough, for about 15 miles traveled that day. ​With plenty of time left, and not much distance to travel, I meandered my way through the fourth day. 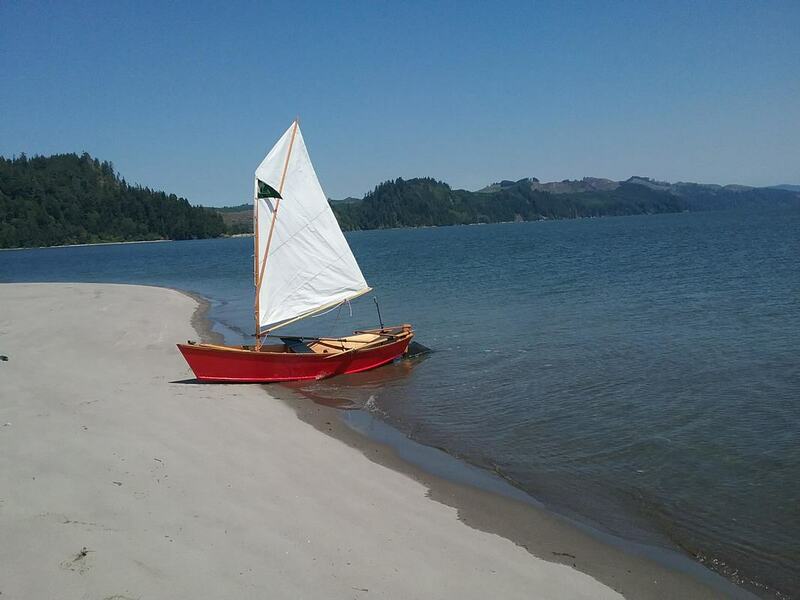 I began by rowing down the Eastern bank of the river, passing at least one hundred fishermen on the Washington beaches, one of whose fishing lines I snagged with my mast. 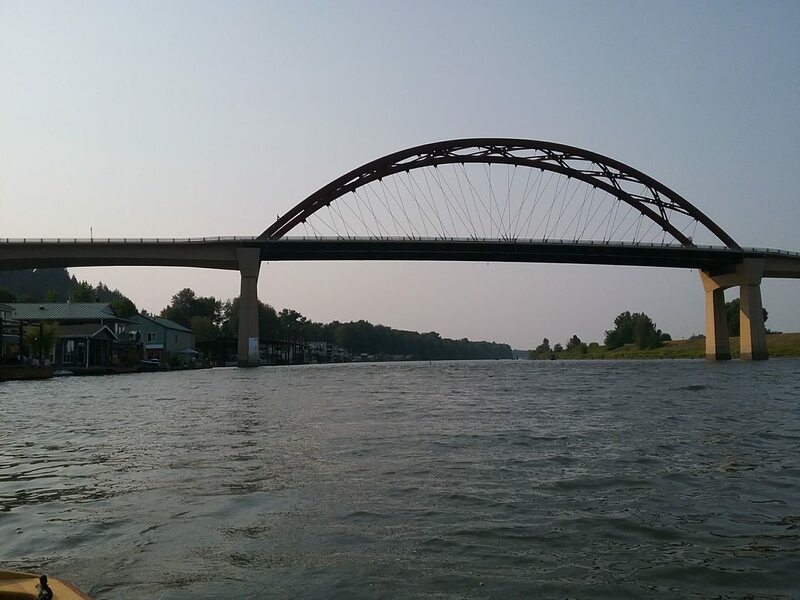 The rest of the day was a lazy cruise down to St. Helens, then onwards to Scappoose Bay via the Multnomah Channel. With 10 hours on the water, I traveled close to 12 miles. The longest and farthest day by far. I left Scappoose at 7 AM. The whole day I waved at other travellers on the river, or folks enjoying a drink on the decks of their houseboats. The Multnomah Channel feels like a small town mainstreet. Around 5 PM I reached the Willamette. The wind built from the lackluster 2-3 kts it had been in the day, and the later it got, the stronger it blew. After sailing through the industrial shipyards and downtown, the breeze chased me the last mile from River Place Marina to the sailing club at around 12 kts. I sailed into the docks at WSC just past 10 PM. 15 hours on the water, and 25 miles traveled. I took a shower and drove to the closest Mexican restaurant, where this time I ate two burritos.